Le Picnic re imagines outdoor lunching as a chic activity that’s worth putting in a little more effort into. Rather than take along a boring sandwich and a flask of coffee to your next picnic, why not a bacon and leek quiche, a beautiful potato and pork sausage galette or cherry tomato tartlets? Classic French recipes can be perfectly transportable and are not overly complex or require particularly hard-to-find ingredients or an advanced skill set. The recipes in the book are designed for the home-cook. 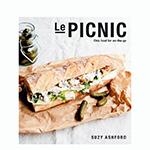 Le Picnic‘s 50 perfectly transportable recipes include drinks, nibbles, more substantial fare, zesty salads and delicate sweet treats. Start the picnic with a glass of Champagne with fresh white peach syrup, nibble on caramelised onion tartlets, a slice of camembert tart and a witlof salad. And finish with a selection of delectable treats including fresh raspberry tartlets and white chocolate macarons. Be transported to Paris on your next outdoor feast! Suzy Ashford is a self-taught cook and food writer based in Sydney, Australia. A frequent traveler to France and lover of the cuisine, this is Suzy’s first book.